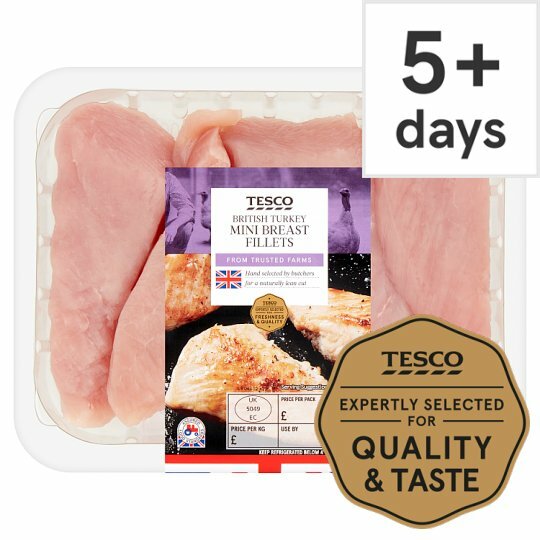 Fresh Class A skinless turkey breast mini fillets. From trusted British farms. Our British turkeys are reared by selected farmers and are free to roam in spacious barns with natural daylight to ensure their wellbeing. Keep refrigerated. Once opened, use immediately., Keep refrigerated below 4°C. Instructions: Pan Fry Heat a little oil in a frying pan or wok until hot. Fry for 10-12 minutes, turning frequently. If the juices are pink continue cooking until they run clear.TipPlace one fillet into the pan and if it sizzles, pan is ready. If not, heat for a little longer.